Anyone who has been travelling around as long in the music business as Wally Warning might safely be called a musical globetrotter but they won't come anywhere near him. The singer and multi-instrumentalist who plays nearly all the instruments on his album himself, has given his life and soul to music since his early youth. At 17 Wally Warning left Aruba, the island of his birth in the Dutch Antilles, in order to conquer the world with his music. After a stopover in the Netherlands he finally found his new home in Munich. With both his unusual and swinging mixture of reggae, gospel and soul elements he has always managed to remain unflustered by all the highs and lows that such a career inevitably exposed him to. After producing and selling his own records without the support of a label in recent years and selling his work mainly at concerts, he will be releasing his new album “No Monkey” with Chet Records. The single of the same name has already stormed the German singles charts thanks to its irresistible hook line. And there's a good chance that he will also be successful with the 14 new album tracks. Wally Warning has already tried out many different things in his musical career, for instance he playes with Curt Cress in the Formation “Snowball” and formed the successful trio “Tax” with Wesley Plass and Eberhard Wilhelm, which is well known well beyond the Munich city boundaries. And the many solo albums with their enormous stylistic variety that he has released since the mid-90's were regularly greeted with enthusiasm. On stage he created a lively atmosphere with appearances such as at the open air at Gorky Park in Moscow in 1995 before 100,000 spectators. His journeys of research through countless genres and styles are not the least of the reasons why he has remained musically unpredictable to date and every time it is an experience to travel with him on such a new journey. And that applies both to his numerous albums and to his fantastic live shows. In concerts in particular it shows that Wally Warning is a live musician to the core, irrespective of whether he's working with a band or solo. The feedback from his fans, many of whom have remained faithful to him through all the years, is very important to him. In his compositions he focuses on messages of reconciliation. Although many of his songs on “No Monkey” such as “Spiritual Love” and “Harmony” are somewhat older, they are still very topical thanks to their timeless message. With Chet Records he has finally found a label again that believes in him and his songs and, what is much more important, entirely shares his musical vision and sets no rules to him with regards to what his music should sound like. With “No Monkey” he has made one of the best and most coherent albums in his career with obvious qualities that simply nobody can overlook this time. What distinguishes “No Monkey” is a pleasant, not forceful positive world view, that runs right through the album like a thread, also when Wally Warning again and again brings his spiritual side to the fore in songs like “Harmony” and “Seasons In Life.” And it is precisely this that also gives this album its great depth. Anyone who thinks because of “No Monkey” that Wally focuses mainly on poppy cheerfulness will be amazed at the other tones that the album contains. “I was born on the island of Aruba in the Southern Caribbean and there I came into contact from my earliest childhood with the most varied musical styles, from salsa via reggae and calypso to soul and pop. My early sources of inspiration include artists like Otis Redding.” Even if we should of course not compare Wally Warning's contemporary music with the classics of the soul legend, it cannot be overlooked that he still feels a connection with this music, especially with regard to his style of singing. 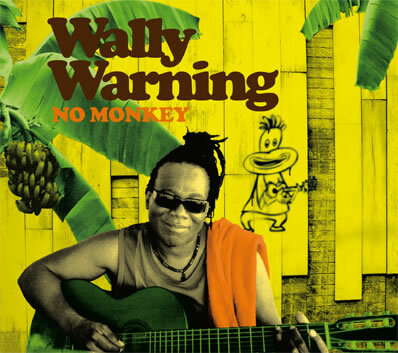 In “No Monkey” Wally Warning once more shows himself to be a musical globetrotter who, as an author once put it very succinctly, celebrates a “better-world music” which, in the true meaning of the words, brings positive thoughts to the fore. His songs are always reduced to the essence and they produce their major effect not least because of their irresistible live feeling. The Musikvideo NoMonkey was released at January 2007 by Harry Flosser. The pure production time was approx. 5 weeks, the whole development time incl. brainstorming and scribbles were over 3 months. "First, if you can take the time to observe the case, then the real power of creativity is coming." The trailer and making-of coming soon!